Microscope design has not necessarily been a problem for short term use, long term sessions have in the past created problems for scientists and technicians who used the instruments. In order to view specimens and record data, microscope operators must assume an unusual and challenging position, with little possibility to move the head or the body, and may be unable to assume the correct posture necessary to avoid incurring injuries . They are often forced to assume an awkward posture with their head bent over the eye tubes, the upper part of the body bent forward, the hand reaching high up for a focusing control, and the wrists bent in an unnatural position. Poor posture and awkward positioning are the primary risk factors for musculoskeletal disorders (MSDs) that can affect full time microscopists, who will often experience pain or injury to the neck, wrists, back, shoulders, and arms. Before using your microscope, look over its various mechanical and optical parts. Even light microscopes differ in how they work, so familiarize yourself with the operations of the particular model you have. You will want to know what each knob does before operating it to avoid overworking or straining the mechanisms. Position the arm of the microscope toward you and the stage that flat platform used for holding the specimen directed away from you. If your microscope has built in light, be sure it is powered on before trying to use it for viewing. 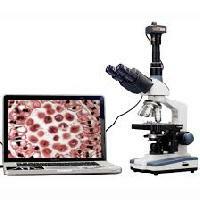 Use your microscope in a well lit room or outdoors. Microscopes often use a mirror to direct available light to the specimen platform, so not enough light will make it difficult to view an object and can cause eye strain. When using your microscope at its highest magnification, some models require special preparation of the specimen or lens. Although microscopes may seem sturdy, they are actually quite fragile as evidenced by their glass lenses and delicate focusing mechanisms. Microscopes have gone down in price over the past couple of decades, and there are many more microscopes available now that are made with inexpensive materials that may not be as durable as earlier models. 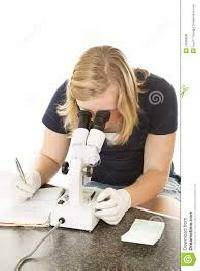 Always pick up a microscope using both hands, one holding the arm of the microscope and the other supporting its base. Although it may seem tempting, never grab or carry a microscope by its eyepiece. When you put the microscope down again, be sure to do so on a flat surface, such as a tabletop. If you are interested in getting a close up view of the world around you, a light microscope could be the right choice. 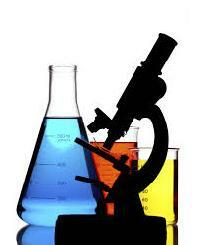 Light microscopes, which employ compound lenses and light, are commonly used in schools and homes. They work by using two lenses: an objective lens close to the specimen being viewed and an ocular lens or eyepiece. Understanding the proper care and use of the microscope can help ensure years of use. One on the arm and one underneath the base of the microscope. Hold it up so that it does not hit tables or chairs. Never swing the microscope. Always carry the microscope with two hands one on the arm and one underneath the base of the microscope. Hold it up so that it does not hit tables or chairs. Never swing the microscope. If they are dirty, please raise your hand and ask for the special lens paper to clean the lenses. If using a microscope with a mirror, do not use direct sunlight as the light source eye damage may result. If using a microscope with a light, turn off light when not in use. If using a microscope with a mirror, do not use direct sunlight as the light source eye damage may result. If using a microscope with a light, turn off light when not in use. Always clean slides and microscope when finished. Store microscope set on the lowest objective with the nosepiece turned down to its lowest position (using the coarse adjustment knob). If using a lighted microscope, turn off light before pulling out the plug. Always clean slides and microscope when finished. Store microscope set on the lowest objective with the nosepiece turned down to its lowest position (using the coarse adjustment knob). If using a lighted microscope, turn off light before pulling out the plug. 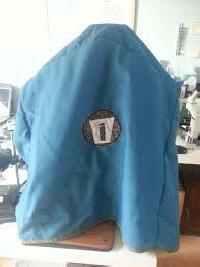 Cover microscope with dust cover and return microscope to storage if so requested. If you are interested in getting a close up view of the world around you, a light microscope could be the right choice. Light microscopes, which employ compound lenses and light, are commonly used in schools and homes. 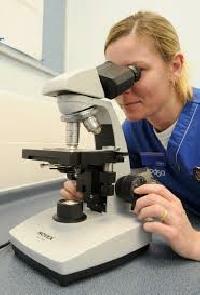 They work by using two lenses: an objective lens close to the specimen being viewed and an ocular lens or eyepiece. Understanding the proper care and use of the microscope can help ensure years of use. If your microscope has a cover or case, always put it in place when you arent using the device. Wet or dirty slides should never be put on the stage, which should always be kept dry. 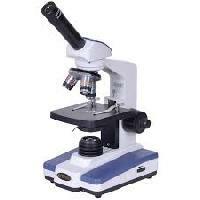 When cleaning your microscope, unplug it first, if applicable, and then clean the outside using a damp, soft cloth only. Never use a dry cloth or paper towel to wipe any optical surface as you could scratch a lens. Use an air blower or a camel hair brush to whisk away dust. If there is dirt on the eyepiece that cant be removed with air or the brush, gently wipe it with a piece of clean cotton. If you must clean the objective lens, use xylitol or absolute alcohol. Never try to clean or take apart the internal pieces of the microscope.